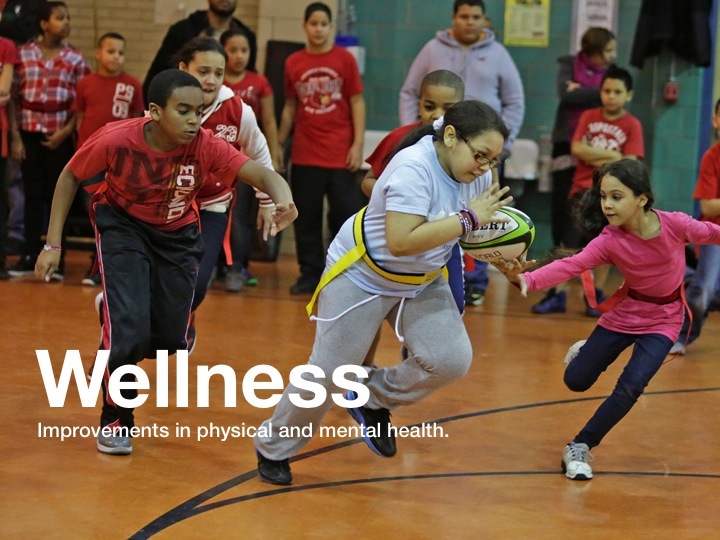 Wellness: Young peoples’ lack of participation in sports is America’s biggest missed opportunity for long-term success. If you glance over international education league tables, you may not be too proud to hear that the USA is punching way below its weight. For the biggest economy in the world, USA’s ranking at 17th (Pearson, 2012) and below average among OECD member countries, leaves much to be desired. In the land of opportunity, where education is the primary vehicle to seize that opportunity, the USA is falling behind its peers. The American dream while still aspirational may be becoming just a little too impossible for too many, to attain. And it’s America’s most disadvantaged, urban youth, that will bear the brunt of this, as the achievement gap continues to grow. I believe improving the wellness of America’s young people is the key to getting the USA back on top. Elementary school participants in Play Rugby USA’s program compete in a fun, indoor, flag rugby tournament. So why does wellness matter? In short, I believe wellness as a core component in USA’s educational policy is the single-most important factor in America achieving long-term economic success. Furthermore, that we need to focus on wellness as the most powerful prevention vehicle we have through our young people who hold our future in their hands. As luck would have it, there is demand for this among our young people. Participation in sports as an extracurricular activity happens to be the one thing the vast majority of kids report they want to do. Why? Because sports are FUN! And, research would suggest that sports (assuming appropriate dosage of the right sport/s, coached in the right way) have proven to be the most effective vehicle for young people achieving and sustaining wellness. Sports prepare young people for life while developing healthy habits leading to improved health & fitness. This ultimately will lead to a reduction in the systemic treatment costs associated with America’s poor health. In New Directions for Youth Development, Michael Bergeron reported that students participating in 1 hour of moderate of physical activity, 4 – 5x per week, during which their heart-rate was at least 50% of maximum –would notice favorable changes in body composition and maintenance. Perhaps Sports biggest asset for young people, is that coached appropriately IT IS FUN! What better way to keep the kids coming back for more exercise! Sports programs have been proven to be the best value approach ($ / student) by engaging multiple students on a frequent basis. The cost of participation in sports is multiples less than the cost of treating obesity. Clearly sports alone cannot prevent obesity but sports happen to be one of the few solutions that positively impact multiple other outcomes of a child’s development. A number of studies show that participation in sports has empowered young people to improve: attendance at school; cognitive function; academic performance; graduation rates and college matriculation rates; while reducing discipline issues; other delinquent behaviors; and ultimately, drop-out rates. In fact, sports correlate more strongly with low drop-out rates than any other activity (Up2Us position statement on Education). Runners World recently wrote referencing a study published in PLoS One that fitter kids (aged 9 & 10) had significantly better memory recall, particularly in harder recall situations. Students from PS279 in the Bronx, representing “New Zealand” took it upon themselves to learn the Haka – a Maori war-dance and performed it at a Play Rugby USA tournament. According to the Center for Disease Control, for young people the optimal dosage of activity is 1 hour / day of moderate to vigorous physical activity. While at school, physical activity can be achieved through participation in physical education classes, through recreation in the playground and through participation in sports. All three are important but sports have the advantage of engaging young people in structured safe play with positive adult role models (coaches) who can facilitate the development of life skills, increase activity levels & facilitate young people having fun. Moreover, sports delivered after-school provide an engaging alternative when young people are most at-risk of being inactive and / or making bad choices. So, why are budget cuts year on year reducing opportunities for young people – especially those in urban areas who are disconnected or disadvantaged – to participate in sports? Why is physical education and sports not front-and-center in the educational agenda, rather than a massively underfunded after thought (which is the reality)? With these budget cuts, pay-to-play participation is on the rise and the future for America’s most in need young people does not look bright. Initiatives like the First Lady’s “Let’s Move” are a step in the right direction by increasing awareness but are still ancillary to the core educational agenda and in creating systemic action & change that is required. According to a recent GAO Report (February 2012) only 55% of schools mandated physical education, and under 16% offered physical education at least 3 days / week (13.7% elementary, 15.2% middle, 3.0% high school). There’s 50 million students in America – so that’s a lot of kids not running around, having fun. Furthermore, the USA, I believe, is one of the only countries in the world without a Sports Minister, sports department, or anything that remotely resembles a body that has any material influence over mandating or supporting sports participation in schools. Without Sports being a core component in America’s educational dialogue, we’re missing a huge opportunity to create a generation of healthy, successful people to drive our economy forward. 1) Instead of ObamaCare shouldn’t we have ObamaFit / ObamaPlay / ObamaSports. I do of course appreciate the need for access to healthcare (I am from the UK after all) but with the reality of finite resources, debt-ceilings and the associated opportunity cost of political decisions, can we not put our tax-money into prevention and start with our kids- our potentially most valuable asset or alternatively our largest long-term liability. There’s a stakeholder model here through public-private partnerships that can truly work, very efficiently, very effectively, to create a long-term legacy of a healthy America. 2) One such model (there are many) could be to simply multiply the force of Coach-mentors across the country (see CoachAcrossAmerica) delivering Sports-Based-Youth-Development programs. We could place them in schools to work alongside (not replace) physical educators and staff from organizations like Playworks – to jointly develop opportunities for students’ participation in sports during & after-school. If we’re moving towards an extended school day (that’s another debate) let’s ensure physical activity & sports are part of the day and the extension! I mean, I know our kids all love taking tests 🙂 but can they also please play some games! 3) Let’s change and improve America’s sports culture from one of elitism and money making to one that also embraces and encourages amateurism and participation. Parents speak up! Sports don’t just have to be for the most talented “Varsity” athletes, they can be fun for all. Community programs don’t just have to be elite travel-leagues, let’s create some additional leagues that encourage participation, play, competition and fun. American professional sports will be just fine – they’re too big and too popular to fail, but let’s get our next generation of amateur sports players activated! 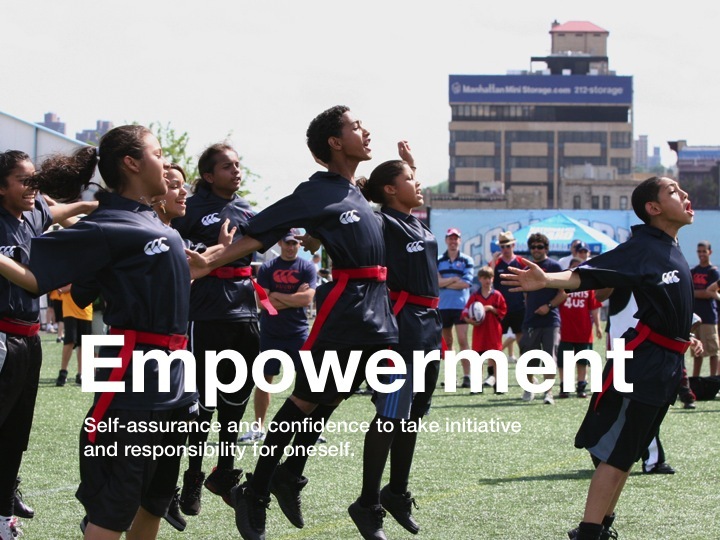 Rugby is inclusive, life-long, inexpensive and in it’s flag (non-contact) form, safe, simple to coach & flexible enough for almost every school in America to adopt. We have a best-in-class online curriculum and coach training program that can support this effort! According to a study conducted by the University of South Florida Flag Rugby (6.03 METS) attains the highest activity levels when compared to flag football (4.93 METS), basketball (5.51 METS). Flag Rugby students also reported to be their highest engagement and competence level, closely followed by basketball and further behind again, by flag football. >6 METS is considered vigorous physical activity for young people. 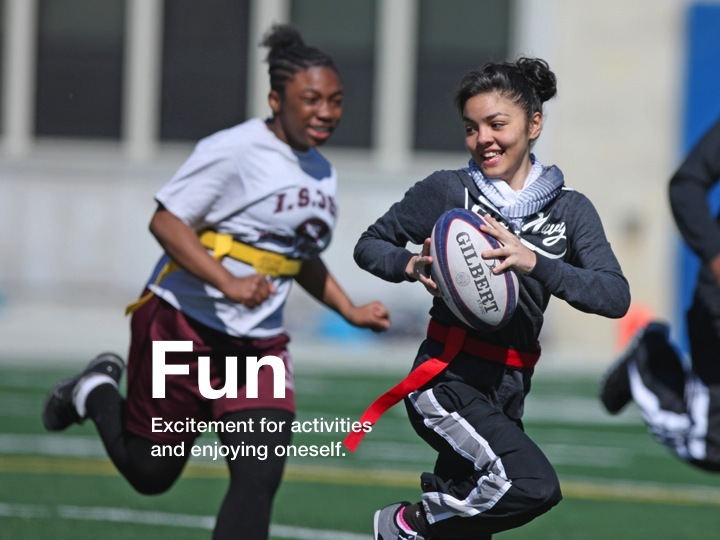 Play Rugby USA’s most recent evaluations with middle school students indicate over 2 after school practices (3 hours total), average heart-rates of over 65% in boys and over 70% in girls. It is player centered – requiring students to make decisions individually & together on the field, enabling them to learn from mistakes, support each other and “go-forward” together. It is fast paced and dynamic – requiring students to “get there” with physical urgency and “switch on” mentally, to make the best decisions for their team in a rapidly changing environment. It is continuous and fluid requiring students to constantly “play what they see” by constantly assimilating visual, verbal and physical queues and reacting accordingly. The “spirit of rugby” is a core component of the laws of the game and engenders integrity, solidarity, commitment, discipline and respect in a way unsurpassed by other sports. And finally, to quote one of our students – Zolia – “Rugby is sanity, you know, mental health”! ‘Like’ the Global Rugby Collaborative on Facebook to Help Support Our Efforts! ‘Like’ Play Rugby USA on Facebook to Help Support Our Efforts! 5 Ways the Global Rugby Collaborative will create a better world – are you our next partner? nviktorkol on Making an Impact: Local Knowledge and Passion vs Science. Proudly powered by WordPress Theme: Splendio.